had me over for tea and cookies. 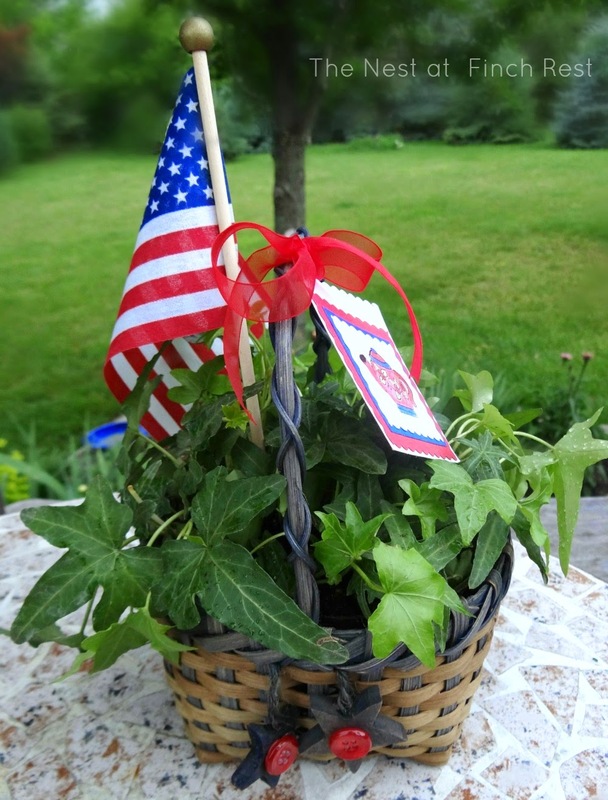 I made up a little "patriotic" planter basket of ivy for her. see I used in a post last year with faux greens on the right? and simply placed them in the lined basket. I stuck a new mini American flag inside it. and attached it with a bright red organza ribbon. I should have colored in heavier now that I see it in a different setting. Oh well. I glued two bright red buttons on the stars for added pop of color. Her tea was simple and sweet, as was her little hostess gift. it's the joy of being together and nurturing friendship. Sometimes the simple things really are the most treasured. and asked me if I had fun colored nail polish they could borrow. I am one of the cool ladies around here apparently, haha. This is what they did and they said I could take a picture. Great job on the basket. How kind of you. Glad you had Tea & Cookies...yum. What a lovely hostess gift, Michele! I love that you gave ivy plants in that pretty little basket. I'm sure your neighbor loved it! LOL - let's go with being the "cool" neighbor as opposed to "whatshername is weird, let's go see if she has some wacky nail polish we can borrow". : ) Have a wonderful weekend! Everything is so patriotic and great, and I love the nails, lol! Enjoy your weekend. What a sweet and thoughtful neighbor you are. I'm sure she was so appreciative of your darling gift and you guys had a great time. Love the nails. You are such a nice neighbor Michelle...maybe you should come over for cookies too! 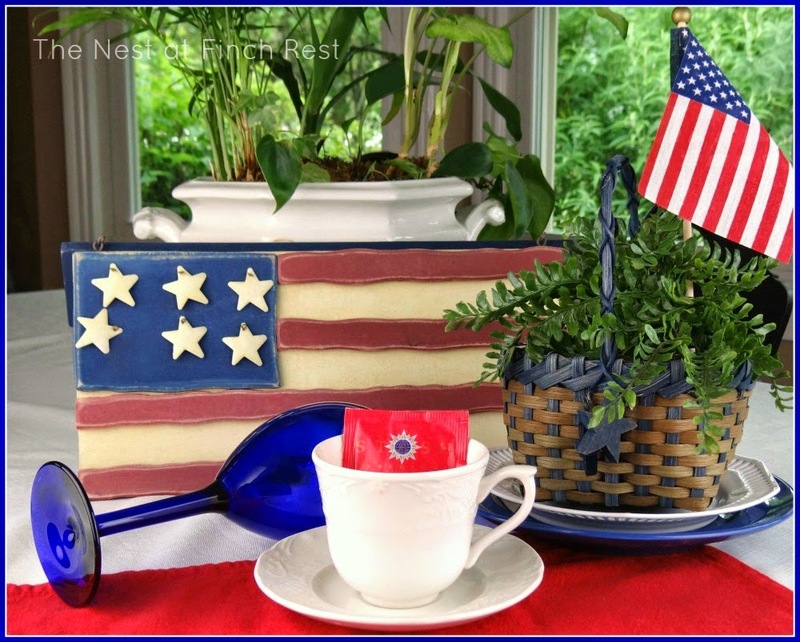 I have a giveaway sweet friend it's on my latest patriotic post. Love you to enter! 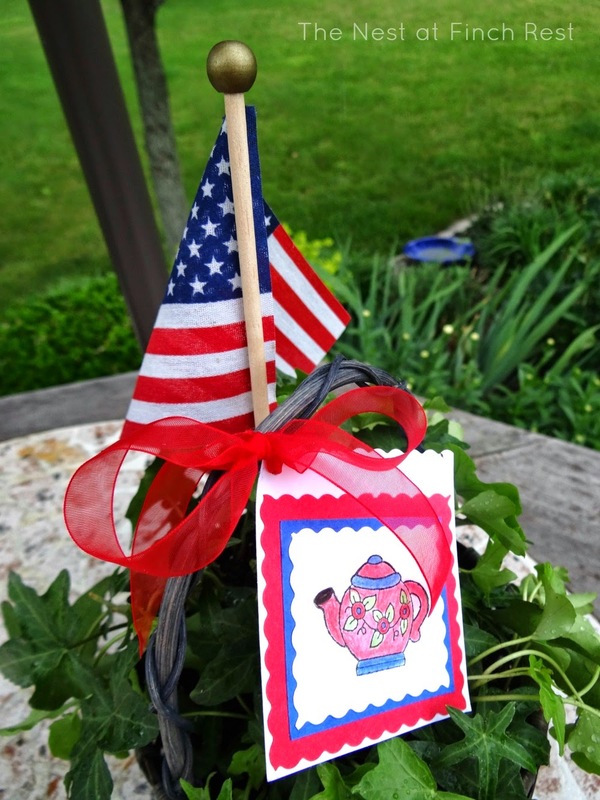 What a pretty patriotic planter!! I ESPECIALLY love the cute card BECAUSE you coloured it - perfectly! 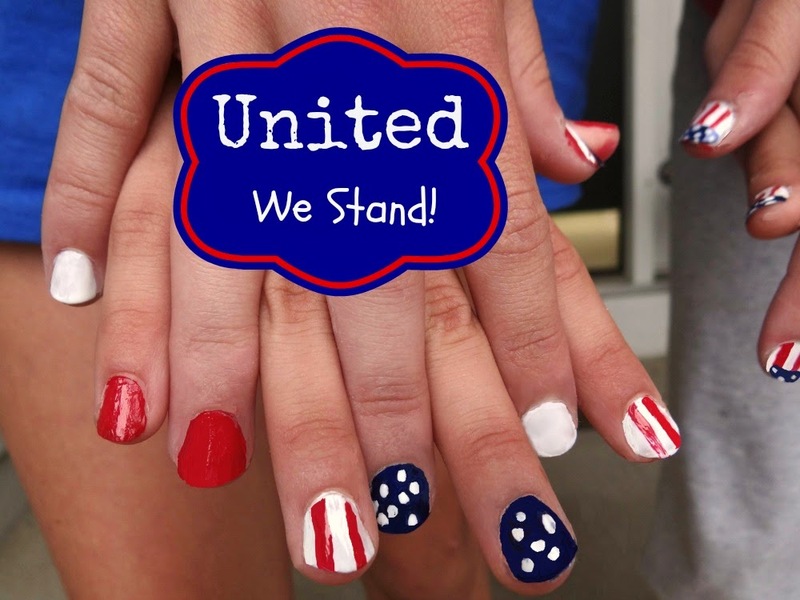 The 'united we stand' nails are a smart idea; love it! What a pretty basket full of ivy. It looks so good and the card WOW. Love the nails - what a cute idea. We learn so much from blogging don't we. Love the basket! You did good on the card and the buttons on the stars are perfect. Love the patriotic planter. So good and simple. The basket and your nails are terrific. How sweet your little gift is for your friend. I agree the best parts of friendship are the memories and time spent. Love the cute nails. 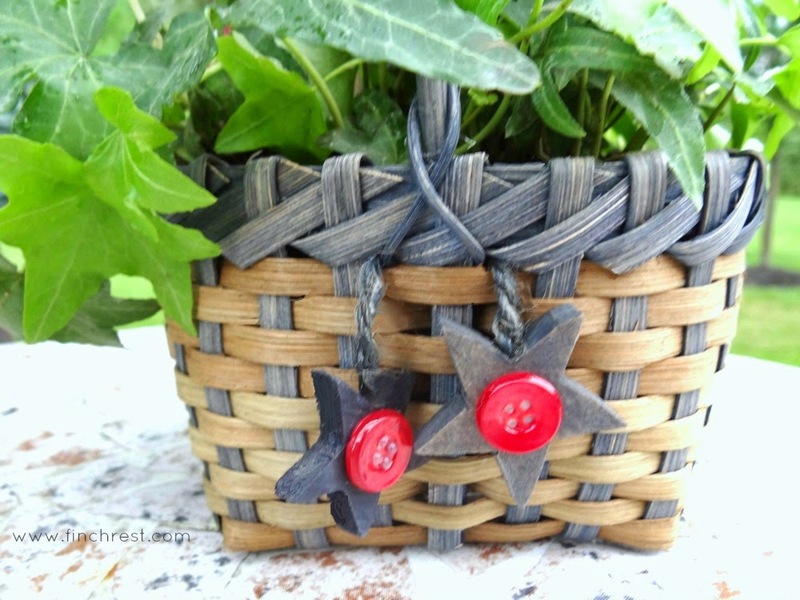 Very sweet gift, I am a believer in making simple little things as hostess gifts… they are always appreciated as I'm sure your little ivy basket was. Have a lovely weekend. Michele you are so sweet. I bet your neighbor really loved her gift. I think it's cute that the girls came over to borrow your nail polish. I ♥♥♥ the first vignette! What a thoughtful gesture! The basket of ivy is adorable. And you must be one of the cool ladies if the girls are requesting nail polish. Pretty cute! What a lovely neighborhood! A charming gift, and I think the tea pot is colored in just right. Angels to you! Thoughtful and sweet gift. Cute nails on the girls. Michele, You are a sweetheart. I know your friend was thrilled. Cute nails- You are way ahead of me. This just makes me think of lovely days gone by -- glad there are still neighbors visiting and having tea together. the bright red buttons were a great touch, I'm sure your gift was appreciated! And congrats on being the cool neighbor to the girls! What a beautiful gift. You're so creative. You are a good neighbor! I love what you did especially the addition of the buttons.